This moist, tangy, delicious Sloppy Joe Recipe is a popular favorite for any meal. To print this recipe, just highlight the text and select PRINT from your file menu. 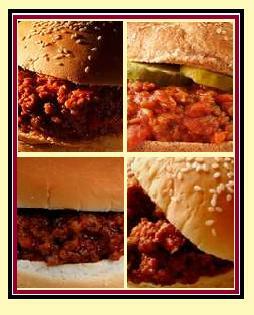 This basic recipe for Sloppy Joes is an All-American favorite for people of all ages. Heat the ground beef and chopped onion in a large skillet over medium-high heat, stirring occasionally. Cook the meat and onion for about ten minutes, or until the beef is browned and crumbly, with no signs of pink remaining. Drain the fat from the the meat and onion mixture. Discard any excess grease from the pan. Wipe the pan with a paper towel and return the meat and onion mixture to the pan. Stir in the ketchup, water, brown sugar, Worcestershire sauce, mustard, vinegar, chili powder, garlic powder, pepper, and salt. Turn the heat to high and bring the beef mixture to a boil. Reduce the heat to low, cover the pan, and let the mixture simmer for about half an hour, or until the sauce has thickened. Place the split hamburger buns open on a plate, with the split side facing up. Pour a ladle of Sloppy Joe mix over one of the bun halves. Then gently place the other half of the bun on top. Serving suggestion: Garnish the sandwich with pickle slices and potato chips. You can make delicious meat pies easily by placing 2 or 3 tablespoons of cooked sloppy joe mix (or cooked meat loaf) into a mini pie crust, or you can wrap up the meat in philo dough. Brush the dough with butter and bake for another 10 minutes, or until the dough is golden brown. See this page for an Easy Meatloaf Recipe. Go here for an extensive Recipe Collection. Hit this link for Authentic American Cuisine from every state.